The route for the high-speed train between L.A. and Anaheim. From the California High-Speed Rail Authority's alternatives analysis for the project. This one is hardly a shock, as officials with the California High-Speed Rail Authority had already been on record as saying the agency would study sharing tracks between L.A. and Anaheim with Metrolink and Amtrak. Nonetheless, the Authority’s Board in a meeting in Los Angeles made it official when they voted today to study the shared use option as part of the environmental review process for the bullet train’s segment between Anaheim and L.A. — that will be part of a larger initial route between Anaheim and San Francisco. The Authority originally planned to build a whole new set of tracks and infrastructure between L.A. and Anaheim that would be completely dedicated to bullet trains — and would also allow them to run at high speeds with no street crossings. But that came at a cost of more than $4 billion, which is estimated to be double the cost of the shared-use option. As a result, local officials in the L.A. area, including Metro CEO Art Leahy, had asked for other options to be considered, citing both the expense of building the new infrastructure and concerns in communities along the way about noise and visual impacts of the trains running above and near their properties. LOS ANGELES – Working in cooperation with regional transportation officials, the California High-Speed Rail Authority moved ahead with environmental work on a plan to share tracks with Metrolink and Amtrak trains between Los Angeles and Anaheim. While still in its early stages, the plan could allow high-speed rail to operate in the narrow and heavily trafficked corridor with a minimum of disruption to neighborhoods and property owners nearby, potentially saving substantial property acquisition costs. The Board voted to approve a Supplemental Alternatives Analysis for the Los Angeles to Anaheim section of the project which recommended that environmental and preliminary engineering studies continue for both a shared-track system, on which high-speed, commuter and Amtrak trains would travel, and for a dedicated-track system devoted exclusively to high-speed trains. The Authority renewed its investigation of a shared-track alternative in response to interest from local officials and a change in policy by the Federal Railway Administration. The shared-track proposal would greatly reduce the need to purchase property, potentially saving significant right-of-way acquisition costs for the project. The shared-track proposal calls for two new tracks to be built and shared among the passenger services in the region – Amtrak, Metrolink and High-Speed Rail – with trains traveling a maximum speed of 90 mph. Three existing Burlington Northern Santa Fe freight tracks in the region would continue to carry a small number of Metrolink and Amtrak trains. The shared-track plans call for up to three high-speed trains through the region per hour, two fewer than projected in the dedicated-track alternative, resulting in a 3.5 percent decrease in projected ridership. 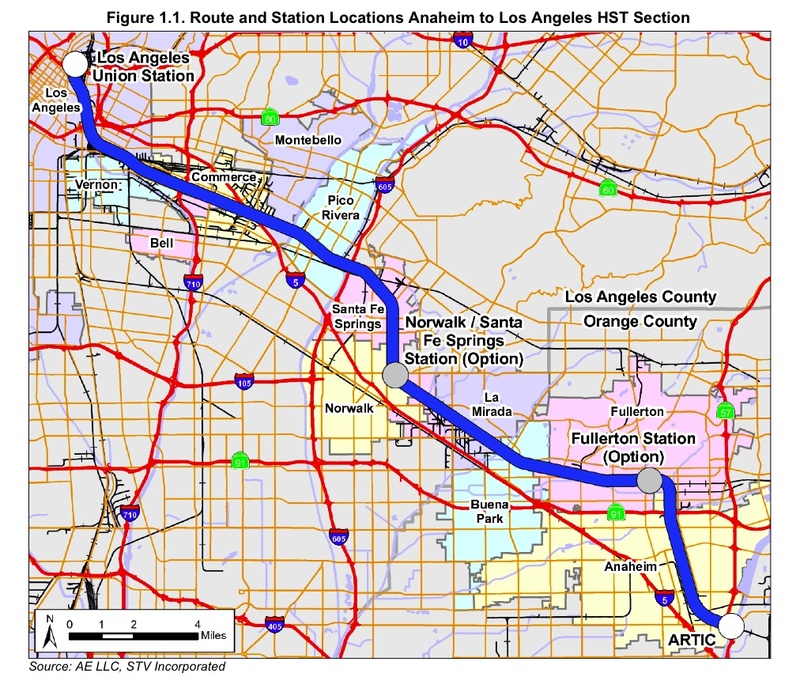 The analysis calls for continued study of stations in both Fullerton and Norwalk/Santa Fe Springs, though only one station is likely to be included in final plans for the project. The analysis also calls for further study of new at-grade train platforms at both Los Angeles Union Station and at the Anaheim Regional Transportation Intermodal Center. The Preliminary Alternatives Analysis calls for continuing to study a number of possible alternatives for this segment of the project, including tunnels or covered trenches to minimize disruption of parks, neighborhoods and the Los Angeles River between Union Station and State Route 2 in Glendale. Through the San Fernando Valley, the analysis calls for high-speed trains to run within the Metrolink corridor, sharing the right of way. Trains would travel at-grade, elevated on viaduct or in a trench to separate the tracks from street traffic. Stations stops in the San Fernando Valley for further study include four different locations: near the Burbank Airport, near Branford Street and the Tujunga Wash in Pacoima, near the 118 Freeway and the Pacoima Wash, and near Maclay Street in San Fernando. The study recommends that one stop be selected. Through the mountains to Palmdale alignment options will run close to State Highway 14, entering Palmdale along two possible alignments, one following the Union Pacific right of way from Palmdale Lake and another option to the west of Palmdale Lake. Both options will include stops near the Palmdale Airport. The Authority’s Board of Directors also received a report on initial alternatives being considered for the project from Bakersfield to Palmdale, which recommended further study of several alternative alignments through Lancaster, Tehachapi, Mojave and Edison. In addition, Chairman Pringle and Vice-Chair Tom Umberg were re-elected to their respective leadership positions. Vice-Chair Umberg attended Thursday’s meeting in person after returning to California from military service in Afghanistan.